Smart Games & Tryazon: Enjoying STEM with Friends! September 16, 2018 September 16, 2018 Abby H.
Getting the gang back together! On Friday afternoon, the kids and I, along with some friends and their moms got together at a local park to explore some fun STEM based games from Smart Games. I invited my home schooling friends, along with other moms that are like me: always looking for educational and fun games and opportunities for kids. What I love about the games from Smart Games is that they are fun- the kids didn’t realize that the games were educational. The kids took turns playing Penguins on Ice, which was the overall kid favorite. The moms liked Quadrillion the most, and we all took turns playing it with the kids and each other. While the games are one player, the kids all worked together, which was great to see. There are no batteries needed, none of the games make sounds or have flashing lights, so it’s all about imagination and working it out. The Younger kids gravitated towards Trucky 3, which is a great visual puzzle game with larger block and little trucks. The other crowd pleaser was Color Code, which quickly was also popular with the moms. Color Code was also the game that we gave away- I love that Tryazon and Smart Games sent us 4 games to try out and keep, and I love sharing with friends- So I try and give away at least 1 item at each party I have. It was a perfect, educational afternoon! There was a lot of giggling, play time, and learning. Working hard on making a pattern. If you want to learn more about Smart Games, their website is full of great information. And if you want to learn more about Tryazon, their website has tons of information about all of the cool campaigns and parties they have coming up! I received the games free in order to facilitate a group party with friends and their kids. All opinions are my own. I was not financially compensated, however, we do get to keep the games! Ring in the New Years at LEGOLAND! December 29, 2016 December 29, 2016 Abby H.
Ya’ll know how much our family LOVES Legoland, right? Well if you are looking for a family friendly way to ring in the new year and have the kids to bed before the real big ball drops, consider spending the day at Legoland! The grand finale of Holidays at LEGOLAND® California Resort is the annual Kids’ New Year’s Eve party! This lively party begins with special musical performances from kid favorite groups Twinkle Time and Lucky Diaz and the Family Jam Band on Fun Town Stage and in Heartlake City. Then, for the first time, the party moves to San Francisco in Miniland U.S.A. where like the famous Times Square party, guests gather for the countdown followed by a huge LEGO® brick dropping 22 feet into 2017 and spectacular fireworks at 6 p.m. to end the night(with plenty of time to spare to get home for bed!). And right now, the deal gets sweeter!! LEGOLAND California Resort is offering a gift for holiday guests: From Nov. 21, 2016 through Jan. 1, 2017, buy a one day admission to LEGOLAND California and return a second day to LEGOLAND California and SEA LIFE® Aquarium for free between Jan. 2, 2017 and March 1, 2017. All Holidays at LEGOLAND California Resort activities located inside the Park are included with regular Park admission (Kids 3–12 $89; Adults $95; Parking $15). For more Holidays information, visit www.LEGOLAND.com or call (760) 918-LEGO (5346). I’ve had such a great year being a Legoland Blogger, and I hope to continue next year, bringing you great promotions and sharing news straight from Legoland! I’ll be sharing some tips on how to save money when planning your Legoland trip in the next few days, just in time for NYE! Our Rockin’ Party at Rockin’ Jump! June 30, 2016 Abby H.
Me and Bitty Bird getting our jump on! Lil’ Man’s Birthday is in March and Itty Bittums turned one mid-June, but I’m never one to turn down a party! When Rockin’ Jump offered me a party for 10 jumpers in exchange for a review, well, I jumped at the chance! The party was so much fun! We had 9 jumpers, and we bounced, jumped, and played for 90 minutes. In addition to the Open Bounce area, There is the X-Beam, Dodgeball, basketball, Stunt Bag Arena,Vertical OPS Climbing Wall, and mini golf! Mini Golf wasn’t included in the party package, but you can add it for an extra cost. Then we retired to our private party room for pizza and drinks. The parents enjoyed a pitcher of Diet Pepsi, and the kids had Capri Sun’s. You can bring in your own cake, so not one to pass up a chance to eat cake, Lil’ Man asked if I could bring one. So I did. It was soooo good. It was from the nearby Gaemme Bake shop. The kids had an AMAZING time. I got lots of texts and messages via Facebook afterwards letting me know that the kids took naps in the car or spoke of nothing else but the fun time they had bouncing. Having done a lot of research for party venues, I am completely impressed with the value that Rockin’ Jump offers! It’s clean, well-maintained, and the party package is perfect for any busy family! You even get an editable email invitation to email out for your party! No clean up, no food to prepare (other than the cake you bring), no games or prizes to think about, in other words: no hassle! You even get your own party host (ours was Stevie- he was super nice!). There are discounts off the Ultimate Birthday Package, Jump Time and Jump and Mini-Golf combo’s! Find all the great deals here. PIZZA!!! Even Bitty loves it! I received this party for free from Rockin’ Jump and USFG in order to facilitate my review. All opinions are my own, and all of the photos are courtesy of Christine Boyce at Clicks by Christine! 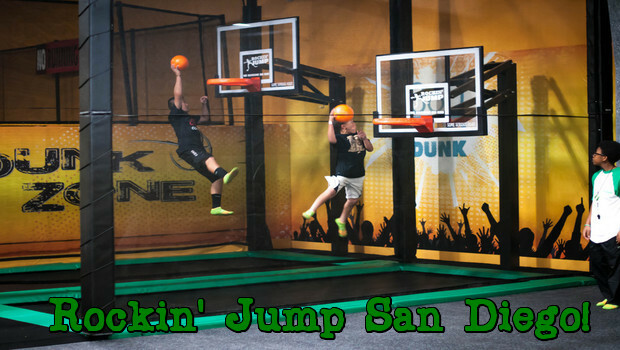 Jump into Fun at Rockin’ Jump San Diego! May 10, 2016 Abby H.
With summer coming, I know moms and dads will be on the hunt for fun, frugal stuff to do with the kids. I was stoked to learn about Rockin’ Tots at Rockin’ Jump San Diego! Henry LOVES trampolines! It’s a great way to burn off energy and get some wiggles out. Rockin’ Jump San Diego– is the Ultimate Trampoline Park! Fun for kids of all ages! 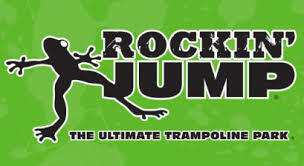 Rockin Jump has a massive main trampoline jump arena and slam dunk zone. The trampoline dodgeball arena provides something for everyone along with more fun attractions! Rockin Jump also offers the perfect Birthday Party Venue and a healthy family activity! I can’t wait to take him! 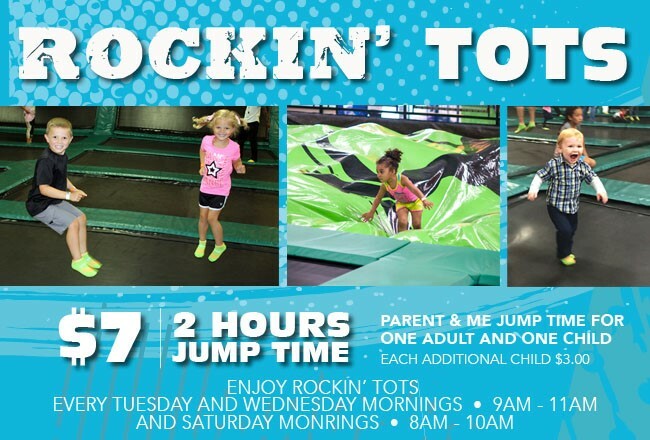 Right now there are some special Deals at Rockin’ Jump – Come jump, flip, bounce and climb at Rockin’ Jump, San Diego’s Ultimate Indoor Trampoline park. Not only do they have a huge trampoline arena, we have dodgeball, a stunt air-bag, Joisting, rock climbing, basketball slam-dunk, a tots-only arena, mini-golf and a cafe’. There are discounts off the Ultimate Birthday Package, Jump Time and Jump and Mini-Golf combo’s! Find all the great deals here. We’ll be visiting soon to check out all of the fun and the party package! I’ll be sure to report back with details and tons of pictures!